Here's the first of a couple of Christmas train-tree combos at the MIschler place. pardon the Bachmann GE Centercab - all of the steam is in the shop or out of town right now. West Side short log cars and a string of (to-be-detailed) LGB disconnects with trees from Michaels at $4.50 each on sale. The tree, also from the same store, also on sale. Bachmann combine will become Santa's ride when we find the right figure in a Christmas Village display, from the same store, probably. Enjoy the Evergreen East Unit Train !! Tonight is the first Sunday in December, time for the annual Toys For Tots train operated jointly with Canadian Pacifics’ D&H and the Marine Corps. I remember one of my early successes at night with flash lighting was here with this train led by D&H 7312 many years ago. I sent the night photo out on that years xmas cards! As 2014 comes to an end 7312 has been repainted into CP engine red and reassigned to the midwest somewhere. 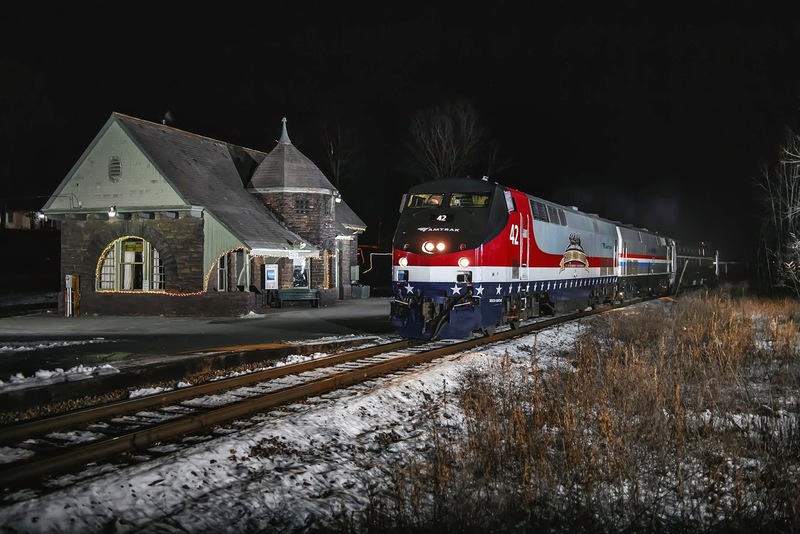 This years train was led by ex-D&H GP 38-2 7307, wearing CP engine red as well, and has been left in Rouses Point where the consist was run around before returning after dark on a deadhead move back to Rensselear, NY with one of Amtraks’ Heritage engines, the colorful Veterans engine number 42 leading. So I arrive a bit after five p.m. in time to see 930 pass by behind a U.P. SD70Ace, then proceed to set up the lighting around the station. Temps are dropping into the single digits above zero with enough snow cover to enhance the scene. Like most folks up here, if it’s gonna be cold we like some snow to go along with the cold. Once I am set up hanging around the stepladder waiting........cars start to arrive at the courthouse which overlooks the station..............on a Sunday night! First the town police cruiser, then three other vehicles. The lights go on inside and I conclude Judge Brian Venne has been called out for a hearing of some sort. Apart from covering the walls in his chambers with my night photos from the immediate area taken over the years, Judge Brian is responsible for obtaining, then painting, the ex-CP RS-18 at the head of the display train here. He also is to blame for granting me permission to climb around the RS-18 looking for new night photo angles, lol! Back down here at trackside I’m stalking around the stepladder for an hour before I hear Amtrak 42 blowing for the crossing at the north side of town..............it’s show time at Port Henry! Less than a minute later the familiar sound effects of GE prime movers reaches my ears as headlight glow silhouettes the hillside above the station and Veterans Heritage unit 42 rounds the curve to head down past the station and the lights. My timing with the shutter finger is good tonight and I get good separation between the engine and station as 42 sweeps past, easier said than done! I know, lol! Examining the photo I am left contemplating what the D&H is becoming...............we have Santa’s Elves running trains now? Do they ah.........well, what could go wrong? This is certainly beyond something CP’s boss Hunter Harrison would come up with to reduce expenses.............right? With a successful image captured I retire to the rental car and warm up, and here is where Judge Brian drives up after presiding at the court house which is seen in the attached photo up behind the station. While we talked he related the quote at the top of the page, lol! We visited for several minutes before Brain headed home and I picked up the lights, ready to head east to Hinesburg. Shot on December 7, 2014 at 19:28 in Port Henry, NY. Please enjoy! Comments are welcomed.